The uncertainty that the future brings can cause many to feel a deserved feeling of fear. But along with that fear can come excitement for what the future may bring, especially when it comes to the advances that come to technology. If you look back to what society envisioned life in the year 2000 would look like, our daily lives are completely incomparable. However, even now some things that were only reserved for the most far out science fiction films and entertainment are well within reach. In fact, they are already usable for us today. Here’s a look at just how much our lives have changed thanks to technology. Our primary mode of transportation isn’t quite the flying cars envisioned in the 1950’s, but we’ve achieved capabilities many thought impossible. Even today our cars can drive themselves, allowing us to take a break behind the wheel. 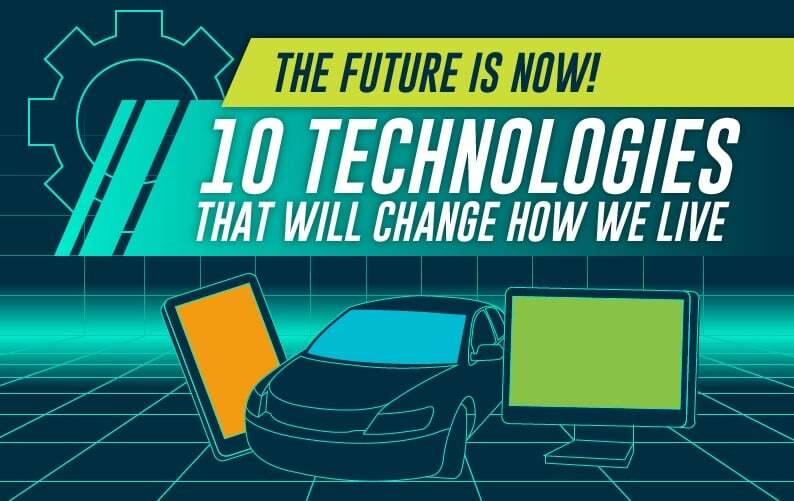 Companies like Google, Uber and Lyft are at the forefront of this new wave of technology. From inspecting busy streets for Maps data, to offering a ride as a taxi from the future, self-driving cars are getting what we need done and taking us to where we need to be. AR involves merging the digital world and real world in ways we never thought possible. From seeing real-time information on shops as you pass them on the street, or snapping a picture from gesturing with your hands. You gain more information on the world around you by having it placed in front of you with your device, be it via wearable tech or your smartphone. Augmented Reality has been about sight since its inception, but sound and feeling through haptic feedback is becoming a larger part of this technology. The industry as whole is expected to grow even more by 2020 to a colossal $90 billion. If you were ever wondering what the next phase of our wireless communications infrastructure would look like, it’s brighter than you might imagine. Using LED lights to transmit wireless information, Li-Fi or Light Fidelity is the replacement for our current Wi-Fi communication today. Reaching much greater speeds of over 224 gigabits per second, it completely blows the old restrictions out of the water. If you were told that you wouldn’t be able to interact with a human being directly to find the answer to your question, chances are you would more than likely be upset. As the demands for technical and customer support grow, the means by which we can maintain a less frustrating communications channel shrinks. Thankfully, advances in AI is the answer to many of our issues. Today, Chatbots are providing 24/7 interaction and allowing for more personalized communication to the point where many might confuse them for actual people. Response times are near instantaneous, and they can determine whether you can be helped directly or need to speak with a live person. It’s a wondrous evolution of automation that should have everyone feeling less frustrated when faced with an issue.